The KHL is the premier league for ice hockey in Russia. Consider the KHL vs the NHL in North America: how do these two professional hockey leagues compare? I grew up in Buffalo, New York, home of the Buffalo Sabres NHL hockey team. I was a massive Sabres fan and went to many of the games when I was a kid. I remember how exotic it seemed when Alexander Mogilny defected from the USSR in order to come to the US to play for the Sabres. Fast forward 28 years. We found ourselves in St. Petersburg, Russia on a 3 day visa free visit by ferry from Helsinki. We happened to be in town when the St. Petersburg SKA team in the KHL (the Russian equivalent of the NHL) were playing a home game against Amur Khabarovsk (incidentally, Alexander Mogilny is now the President of this club). After some trial and error (and bank wariness over our foreign credit card transaction in Russia), we managed to secure seats and headed to the match. In this post, I'll compare what it's like to go to an NHL hockey game in the US or Canada vs a KHL hockey game in Russia. Some of the differences might surprise you. The first thing that we noticed was that the cost of hockey tickets for the St. Petersburg SKA were an order of magnitude lower than the price of NHL tickets. We paid 400 rubles (about $6.50 USD at the time of writing) for seats behind the goal. It would have cost us at least $100 USD to sit in similar seats at a Buffalo Sabres game. We took our seats for the St. Petersburg SKA game and realized that just like in the NHL, players like to make a grand entrance. The SKA players skated onto the ice through a giant star with much cheering and fanfare from the crowd. Just like in the NHL, KHL games start with the national anthem. In this case, the players were lined up on the blue line to hear the Russian national anthem instead of the US and/or Canadian national anthem. For us, it was a surreal experience standing there while the music washed over us. When you go to an NHL ice hockey game, when the puck is dropped, people sit and watch the game intently. Not so for the St. Petersburg SKA. We bought our tickets on the day of the game and found ourselves sitting in what could only be described as the super-fans section. Guys in front of us waved incredibly large St. Petersburg SKA banners back and forth even after the puck was dropped. See the super-fans in action for yourself in this video. Not only did the St. Petersburg SKA super-fans wave their flags but they also had a wide range of choreographed chants. In the US, the chants are catalyzed by an organ playing over the PA system. Here, one of the super-fans would bang on a drum to get things started. One of my favorites was the St. Petersburg SKA scarf chant. These fans mean business! At an NHL game grabbing some food and a beer to eat at your seat is all part of the experience. In St. Petersburg, we made the mistake of buying a beer before heading to our seats. When we tried to go in, the ushers wouldn't let us past. They didn't speak English and we don't speak Russian so it took a minute to figure out what the issue was. Food and drink are not allowed in the seating areas. No wonder there was no line at the beer stand! We left our beers behind and got to our seats just in time for the opening face-off. ...and a guy that looked like Humpty Dumpty. At the end of the game, all the mascots took to the ice to celebrate St. Petersburg SKA's victory over Amur Khabarovsk. In the National Hockey League in the US and Canada, games feature lots of hard checking, fights, and penalties. In the KHL, play is much cleaner and much more wide open. There was not a single fight and much less checking. NHL and KHL fans alike love to make some noise. Each seat in the arena had a banner that could be folded into an accordion shape and smacked against a hand or leg. When multiplied by more than 10,000, the sound was deafening. Just like in the NHL, fans love to taunt the opposition with renditions of We Will Rock You! St. Petersburg SKA dominated the Amur Khabarovsk so we got to see the fans react to goals several times. Just like in the NHL, loud techno music and lights on the Jumbotron help the fans celebrate. Everybody dance now! Both the NHL and KHL feature cheerleaders to rally the fans. St. Petersburg SKA featured a small army of cheerleaders with at least 4 or 5 assigned to each section. How's that for team spirit! We also discovered that the cheerleaders themselves were mild celebrities. During the intermission, the cheerleaders would dance in the corridors. This guy really got his groove on dancing with them. The fans seemed to love, love, love the St. Petersburg SKA cheerleaders! NHL and KHL hockey games both feature fans that love to appear on the Jumbotron. In fact, appearing on the Jumbotron was one of only a few things that seemed to make Russians smile. Kiss-cam, anyone? Some things are universal. Both the KHL and NHL fans like to do the wave. The ability of St. Petersburg SKA fans to keep the wave going was quite impressive. In the NHL, teams only shake hands at the end of a playoff series. In the KHL, the spirit of sportsmanship is alive and well and the players line-up and shake hands after every match. The NHL was founded in 1917. The KHL on the other hand has only been around since 2008. St. Petersburg SKA themselves have a long and storied history. When we were there, they were celebrating their 70th anniversary. This is even more impressive because they were founded in 1946, a year after World War II ended and only 2 years after the siege on Leningrad was broken (hundreds of thousands of people starved to death under the Nazi siege on Leningrad (now St. Petersburg)). 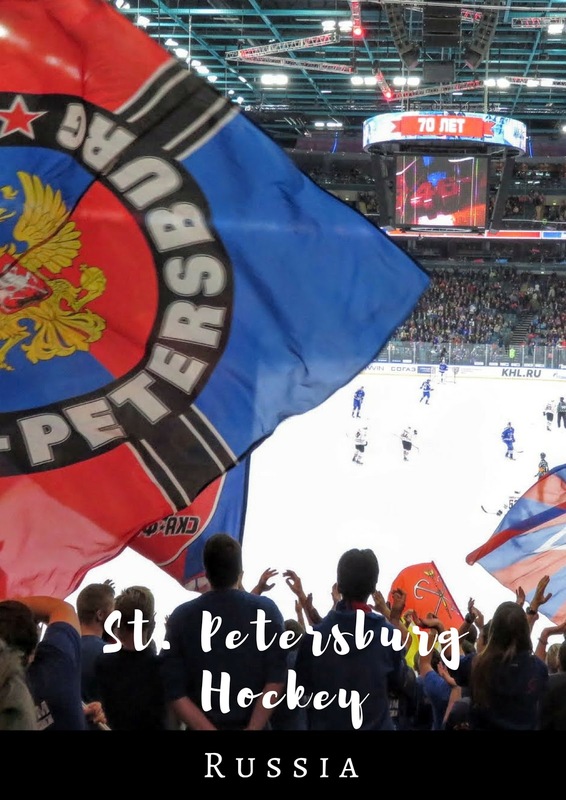 Would I Recommend Going to an Ice Hockey Game in St. Petersburg? If you're a hockey fan, catching a KHL game is a must-see attraction in St. Petersburg if you're there during the season. St. Petersburg is filled with A-list tourist attractions like the Hermitage and Peter and Paul Fortress but it was worth it to take the metro out to the arena and get a truly local sports experience. Go SKA! We will rock you! Experience ice hockey in Russia. Compare the KHL vs NHL (North American professional league) by going to a St. Petersburg hockey game.